When the Wyze Cam version 2 was launched in the last part of 2017, it caused quite a stir. After all, this 1080p camera is dirt cheap, but time and time again, critics have raved about it’s quality. 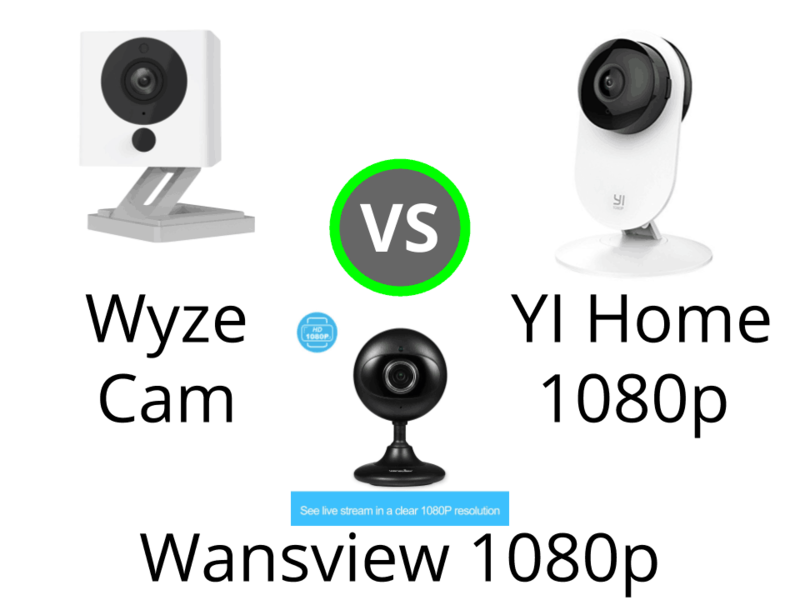 In this post I will compare the Wyze Cam V2 vs the YI Home 1080p vs the Wansview 1080p as I try to answer the question, can you buy a decent 1080p smart security camera for less than $50. And, if you can, what compromises do you make? What I love about these three cameras is that despite being approximately the same size, they are all completely different shapes. From the boxy- looking Wyze Cam to the tear drop shaped, Nest Cam look a like Wansview to the curvy design of the YI Home, these three camera could not be more different. If you like your smart gadgets to be well designed, these three cameras will offer you quite a choice. These cameras are all approximately the same height- the measurements given for the Wyze Cam do not include its stand. If you are struggling to work out just how big these cameras are, as a man with average size hands, they all sit quite comfortably in the palm of my hand. The cameras have three different types of bases. The Wyze Cam is mounted on a hinge (or folding legs) that allow it to tilt forwards and backwards. It has a magnetic base and an adhesive base meaning that it can be mounted on a variety of horizontal and vertical surfaces without the need for screws. The YI Home camera also has a hinge that connects it to its base and allows it to flip forwards and backwards. It is most easily mounted on any horizontal surface. It doesn’t come with any screws and so the recommended (and only) way to attach it to a vertical surface such as metal or glass is to use double sided sticky tape. The Wansview camera is connected to its base via a ball and socket joint allowing it to swivel and rotate. It has an enormous range of movement. Just look at the snippet from the video below. It can stand on any horizontal surface and if you want to attach it to a vertical surface then it comes with some screws and wall plugs in order to help you to do this. The Wyze Cam wins this for it’s simple and elegant design and mounting options. The motion detection technology that the Wyze Cam uses is slightly different because the camera doesn’t detect motion. Instead it analyses the footage that it is recording and detects any changes in the pixels that make up an image. When you view any footage with motion in it, the area of the screen with motion in it is highlighted by a green box. The sensitivity of the motion detection settings can be controlled by placing them on high, medium or low. A fairly standard feature that the Wyze Cam lacks is not being able to create motion zones or activity regions. These are user defined areas within the camera’s field of view that can be individually monitored for motion. It will only send you push notifications about motion detection- you can’t set it up to send you an email. In order to have better control over motion alerts, you can create a schedule (think calendar) when you do and don’t want to receive alerts throughout the day. This camera has all of the motion detection features of the Wyze as well as having an extra feature. With Home 1080p, you can set up activity zones, which were discussed above. The only motion detection feature that this camera doesn’t have is the ability to schedule the alerts. 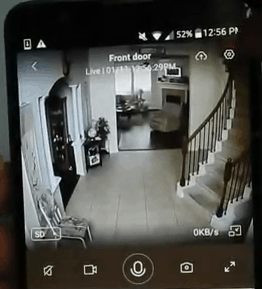 The Wyze Cam and the YI Home cameras can send a user separate sound alerts. However, the YI Home 1080’s sound alerts are limited to its baby crying detection feature. This is when the camera will notify you if it detects a baby crying. The Wyze Cam will notify you if it detects any sound. The Wansview camera doesn’t send separate sound alerts. Only the Wyze Cam in this comparison can inform a user if their smoke alarm or CO2 alarm is active. The Wyze Cam’s ability is because the app will recognise the “chimes” from a standard smoke alarm or CO2 detector. It isn’t connecting to these devices via WiFi or via some smart home system, the camera just recognises alarms- as long as the devices are less than 10 years old. This is a tough one because none of these cameras offers all the features that I would like to see. The closest camera to security perfection is the Wyze Cam. In this section, I will explore specifications that relate to video and audio. In many ways, the Wyze Cam and YI Home 1080p have very similar video and audio specifications, as you will see below. All three of these cameras record footage at 1080p resolution. This is the resolution of some of the top smart security cameras. The higher this number is, the better the quality and clarity of footage- particularly with moving objects. Cameras that use a higher FPS have less “blur” with moving images. The best camera in this sense is the Wansview camera with a 30 FPS. The Wyze Cam and YI Home cameras FPS is only 15. The lens that the Wyze Cam and YI camera use are the same. It is a 1/2.7″ CMOS sensor, whereas the Wansview uses a 1/3″ CMOS sensor which is smaller. Bigger sensors produce better images because they are able to capture and use more light than smaller ones. The WyzeCam’s zoom is way ahead of the other two cameras in this comparison in terms of it’s zoom capabilities. It can zoom up to 8 times, whereas the YI Home and Wansview can only zoom in up to four times. Obviously the size of the field of view for a security camera is important because, the more that a camera “sees” the more secure an area is- and the less time that you need to spend time changing the direction that a fixed lens camera is facing. However the Wansview’s field of view is larger at 120º. All three of these cameras have two way audio. This allows a person who is standing next to a camera to talk to a person who is connecting to the same camera via an app. Live Stream allows a camera owner to connect to the camera via an app and view the camera’s footage live. This is an incredibly popular feature of smart security cameras and it isn’t hard to see why. For inside cameras such as these, it allows parents who are still at work to catch up with their children at home. Press the microphone to talk to a person next to the camera. The camera that has the strongest set of video and audio features is the Wansview 1080p. None of these cameras are battery powered. All three of these cameras rely on having a power supply. The supply is made up of a USB cable and an adapter. The end (that is plugged into the back of the camera) is micro USB and the end that plugs into the adapter is USB 1 . The WyzeCam’s lead is 1.8 meters or 6 ft long and the Wansview has a 3 meter (10 foot) long cable. I am not sure about the length of the YI camera’s lead. The Wyze Cam also has a unique features that you can connect multiple cameras together (by USB) and they will all be powered- as long at the first one camera is connected to an ac adapter. The Wansview camera doesn’t use cloud storage at all. The Wyze Cam only has one cloud storage plan and the great news is that it is free and it will store any footage for 14 days. Motion alert videos recorded by your camera are between 10 to 15 seconds in length and these will all be stored safely. YI Cloud has 6 paid plans, some of which are designed for cameras that only record when they detect motion. YI also provides some CVR (Continuous Video Recording) plans. With CVR plans, cameras are recording constantly 24 hours a day, 7 days a week. 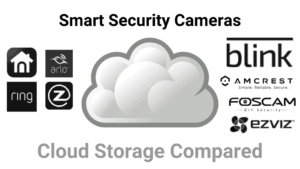 Both Wyze Cam and YI Home take their users security very seriously so any footage stored in the cloud is encrypted using AES 128 Bit technology. The Wyze Cam can record footage onto a micro SD card. The maximum capacity is 32 GB. Using a micro SD card you can turn your Wyze Cam from a motion alert to a CVR camera. The YI Home also has a slot for a micro SD card and it’s maximum capacity is 32 GB. But the Wansview camera uses micro SD cards with much higher capacities- up to 128 GB. You can use the SD card to store just video clips from motion alerts or to store footage from a Wansview camera that is constantly recording. For me, the Wyze Cam wins this section. It provides limited but free cloud storage that is perfect for the needs of its users and if you prefer to store footage locally, you can use a micro SD card. In this next section, we will look at how these cameras connect to the Internet. The Wyze Cam, YI Home and Wansview only use WiFi to connect to the Internet. And they all only connect to routers that run at 2.4 Ghz and not 5 Ghz. 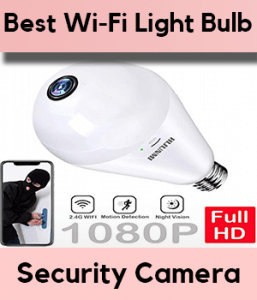 The cameras are not large enough to have Ethernet ports and unlike other smart cameras, they do not use Bluetooth to connect to a smart phone as part of the setup process. The Wyze Cam only comes in white and grey but the YI Home and the Wansview camera are available in white or black. There is no winner in this section. In this section I will explore the three camera’s remote access capabilities. In how many different ways can they be connected to? This camera has the most restrictive remote access features because the camera can only be connected to by using apps on an iPhone, iPad or Android device. You can’t use a browser on a laptop to access your camera and you cannot download any software so that the camera can be accessed on a Windows or Mac computer. If you want to access your Wyze Cam using your iPhone, it needs to be running iOS 8 or later. This camera can be accessed from iOS devices, Android devices and from Windows or Mac computers. To use the YI camera on your iPhone or iPad, it needs to be running at least version 7 of iOS. An Android powered smart phone needs to be running version 4 of the software, named KitKat. YI provide free software to download and use on your Windows or Mac computer. This camera can be accessed in many different ways. If you want to use the Wansview app on your iPhone or iPad, the requirements in comparison are minimal. Just make sure that at least iOS 7 or later is running. You can access the camera on your Windows or Mac computer by downloading a free piece of software for your PC here or for your Mac here. There are joint winners in the “remote access” section. I think that the YI Home 1080p and the Wansview 1080p are equal because of how flexible they are. In this section, I explore if any of these three smart cameras are compatible with some of the biggest smart home systems. Making these connections means that these devices can do more or that they are more flexible. However, as can be seen from the chart above, neither the Wyze Cam, Yi Home or Wansview will connect to any other smart devices or smart home systems. This is a real disadvantage of all of these cameras. This camera offers outstanding performance for a ridiculous price. Once again, a great camera but it is overshadowed by the charms of the Wyze Cam. I think that the chart says it all. If you want to buy any of the cameras in this comparison, buy the Wyze Cam!